One of America’s most popular retailers was aiming to increase their share in the pharmacy market – a sector dominated by drugstore chains. 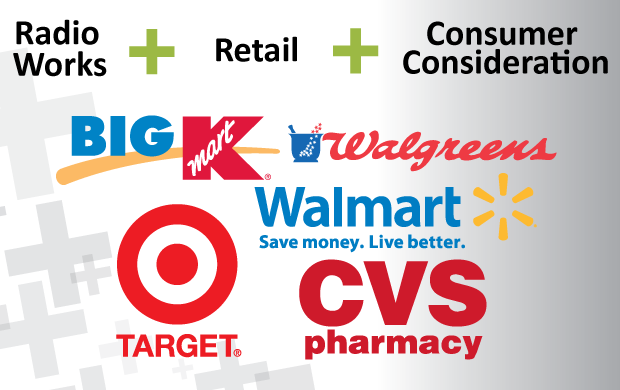 In the spring of 2012, the retailer utilized radio exclusively in key markets to promote their pharmacy department. The radio campaign — emphasizing the unique benefits their pharmacy provided consumers — aired for one month (at 150 GRPs/week). Katz Marketing Solutions commissioned Ipsos MediaCT to conduct online interviews with 900 drug store prospects (who reside in the same geographic footprint as the radio campaign) at the conclusion of the campaign. Data comparisons are based on prospective consumers who were exposed to the radio campaign vs. consumers who were not.